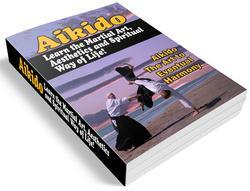 Every martial art system stresses the development of arm and elbow power and strong finishing movements. In the Daitoryu, stability of the hips and legs and good posture is also very important In medieval times, many battles were conducted on horseback and a high-ranking warrior needed to be able to use both hands and legs equally well in order to control a horse and wield a weapon simultaneously. The samurai of the Aizu domain were said to be especially good at incorporating the movements of everyday life in the castle—sitting, standing, walking—into their martial art training. 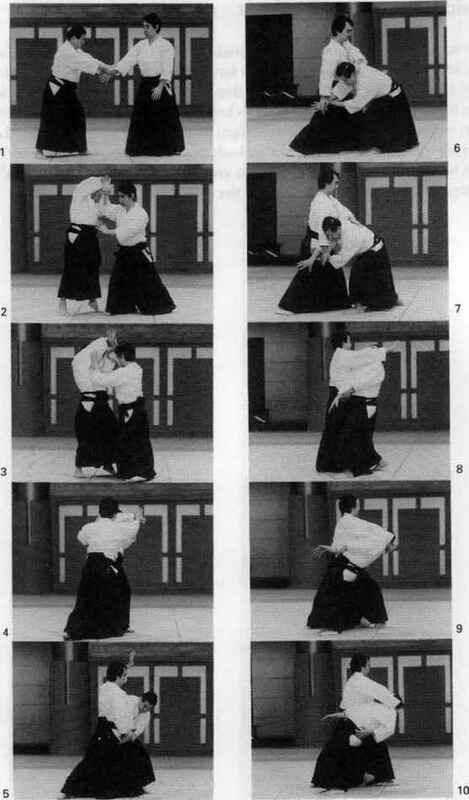 The basic stance in Daitoryu is the "horseback riding posture," with the body facing forward, feet spread and arms at the sides, as if one were riding a horse into battle. This is a natural, stable posture also commonly employed in Chinese martial arts, where it is said to aid in the free flow of ki. The following basic training methods are good for facilitating full use of the hands when moving, and for helping to improve stability of the hips and legs. 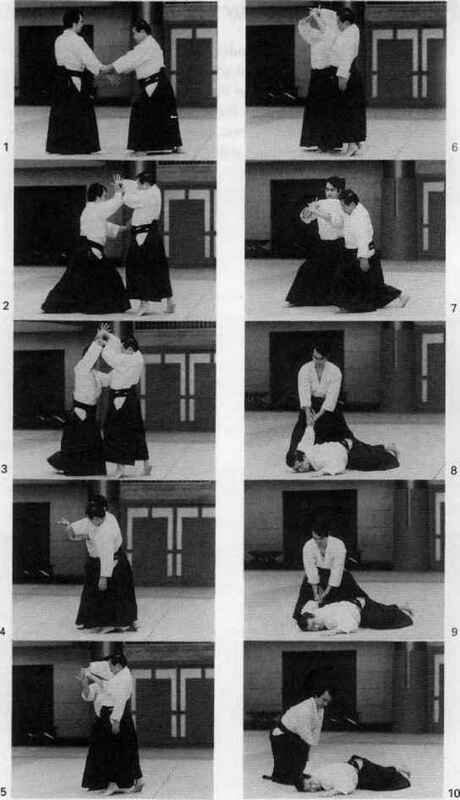 Other basic techniques such as ikka-jd, nika-jo, sanka-jo> kote-gaeshi, and shihd-nage differ tn detail, but operate on the same fundamental principles. Tori stands in right hanmi with both hands extended. 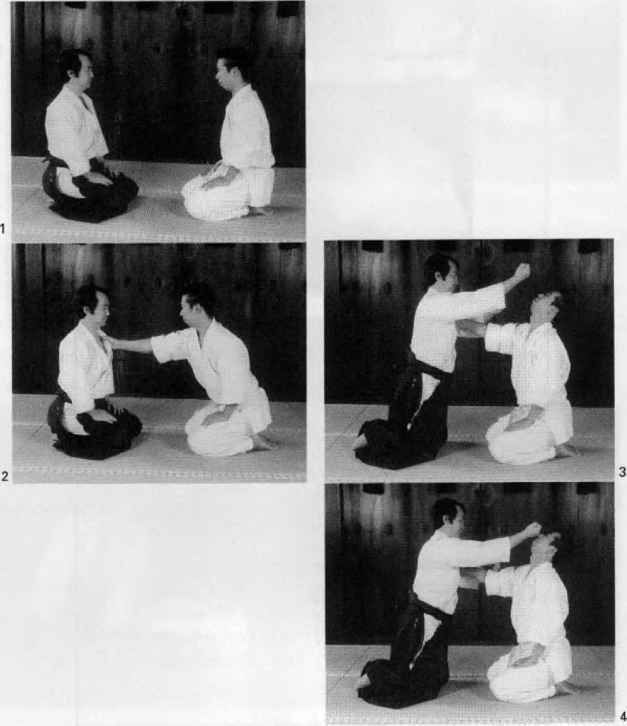 Uke firmly grabs ton s right arm with both hands, Tori steps forward on first the right leg and then the left, and relaxes his shoulders while keeping his head and shoulders up. 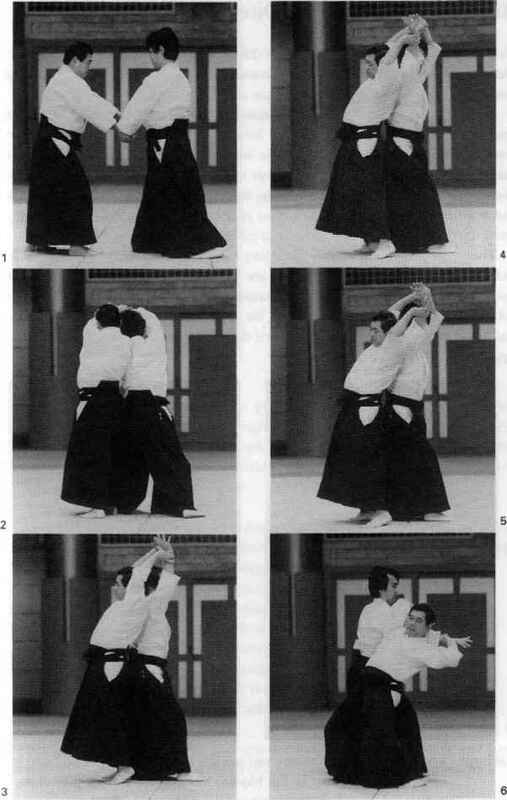 Tori then pivots 180 degrees on his right foot, sweeping the left leg around while holding uke"s elbow. After planting both feet solidly on the ground tori releases his grip on uke s arm, holds ukes head with his left hand, and straightens up. Tori lifts his right arm, cradles ukes head in his arms, and then steps forcefully behind uke, bringing his right arm down to effect the throw. Tori stands in right hanmimih both hands extent. uKe grabs both of tons wrists. Tori shifts his feet diagonally to the right and spreads his fingers, keeping his hands directly in front of his own center. Tori then steps in with his left leg, raising his hands high above his head; uke follows the movement, which brings him back-to-back with tori. Tori brings both arms down, causing uke to "float" on his toes, facing the opposite direction. Tori reassumes a stable right hanmi stance.